Would you order this $78 taco? 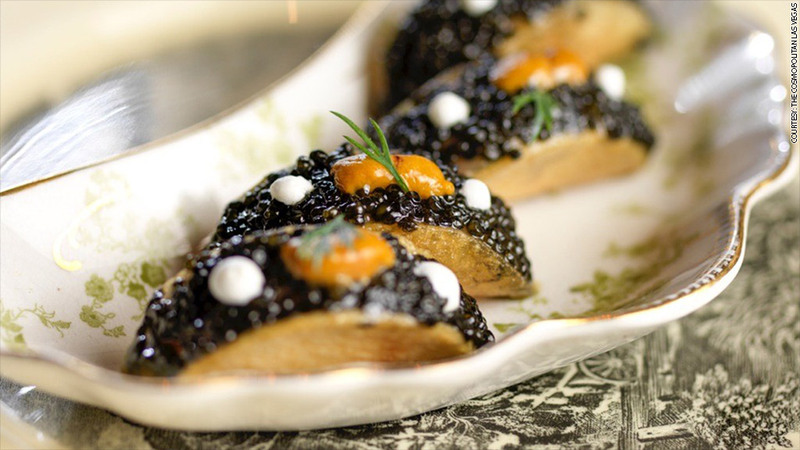 These caviar tacos grace the menu of 'Rose.Rabbit.Lie.,' a restaurant inside The Cosmopolitan Las Vegas. Caviar is the new condiment. From tacos and flatbread to pasta and burgers, caviar -- those shiny little balls usually passed on a small spoon by a white-gloved waiter -- is shedding its stuffy image and lending a highbrow take to a regular meal. "It's about sharing in that little taste of luxury," said Wesley Holton, executive chef of "Rose. Rabbit. Lie." at The Cosmopolitan of Las Vegas. His menu offers both tacos and flatbread with caviar. A taco with Hackleback caviar costs $15; one with Russian Osetra caviar, a more expensive variety, is $78. The flatbread, which has egg, bacon and a large dollop of caviar, is $19. Flatbread with caviar is also served at Petrossian, an upscale restaurant in West Hollywood, Calif. It's a small dish and costs $28. 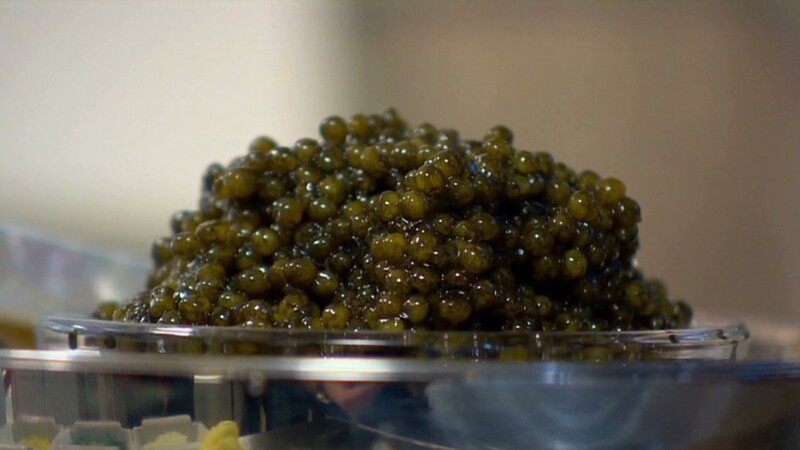 The restaurant also offers pasta made with a caviar powder, which is created from dried caviar in a process the restaurant says is secret. "You can grind it right on top of an omelet or pasta, as we do," said Rori Flynn, a Petrossian employee. She said it adds a nice crunch. Flynn said the chef, Giselle Wellman, works to incorporate caviar in many different dishes. "People can be a little nervous about caviar so she tries to put it in a form that's approachable to everyone," Flynn said. 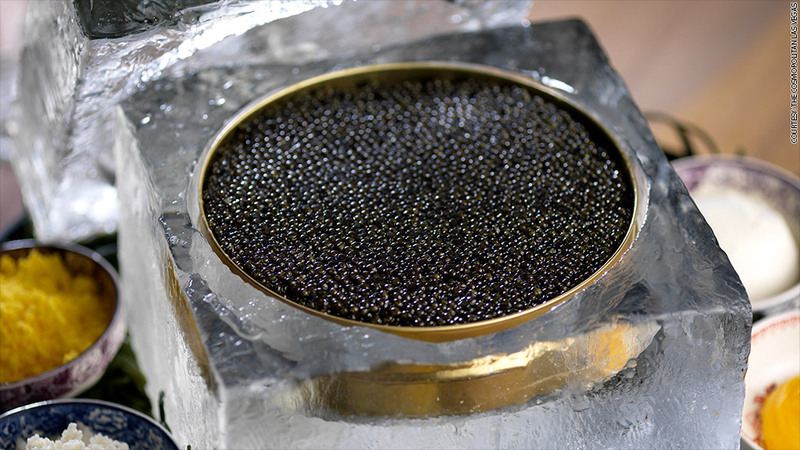 Caviar is served in various amounts. A kilo at 'Rose. Rabbit. Lie.' costs as much as $5,054. It would be understandable to assume caviar is a delicacy reserved for the 1%. Those salt-cured fish eggs can be pricey, and often are treated with serious ceremony. An ounce of the good stuff can cost nearly $350. For those wanting to retain some of caviar's exclusivity without the tradition, there's always the fancy burger. Petrossian offers a caviar hamburger, though it isn't on the regular menu, so customers need to know to ask for it. It includes caviar aioli and costs $75. A smaller version is available on the happy hour menu for $15. Meanwhile, Manhattan burger joint Beer & Buns offers a burger with beluga caviar and foie gras piled on top of a Kobe beef patty for $250. That's less than the world record for the priciest burger, a title held by New York restaurant Serendipity 3. That caviar-topped burger costs $295, and also comes with a donation to charity. It is available by appointment only. For those who don't want to make a burger appointment, or spend that kind of money, Serendipity 3 offers a burger with black caviar, sour cream and cucumber slices for only $18.50. Over at Las Vegas' "Rose. Rabbit. Lie.," chef Holton hopes that even as caviar appears on more everyday dishes, it will still be considered special and celebratory. "But it would be nice to see it be a little bit more popular," he said, "where people aren't intimidated to order it." What's the most expensive restaurant item you've ever ordered? Tell us -- and if you have a photo, show us -- at #BigMoneyMeal @CNNMoney or email jillian.eugenios@cnn.com. The best responses may appear in a future CNNMoney feature.